Battle Cry is the riveting Marine epic by the bestselling author of such classics as Trinity and Exodus.Originally published in 1953, Leon Uris's Battle Cry is the raw and exciting story of men at war from a legendary American author.This is the story of enlisted men – Marines – at the beginning of World War II. They are a rough–and–ready tangle of guys from America's cities and farms and reservations. Led by a tough veteran sergeant, these soldiers band together to emerge as part of one of the most elite fighting forces in the world. With staggering realism and detail, we follow them into intense battles – Guadalcanal and Tarawa – and through exceptional moments of camaraderie and bravery. Battle Cry does not extol the glories of war, but proves itself to be one of the greatest war stories of all time. New York: G. P. Putnam's Sons, 1953. 1st Edition. Hard Cover. BOOK NEAR FINE/JACKET VERY GOOD. 8vo - over 7¾"" - 9¾"" tall. Signed by Author. SIGNED BY THE AUTHOR on a special, decorative bookplate. A VERY CLEAN, ATTRACTIVE COPY WITH A BRIGHT DUSTJACKET IN NEW, GLOSSY BRODART. Scarce 1st printing. NOT PRICE CLIPPED. NO PREVIOUS OWNER MARKINGS. 505 pages. Author's first novel. Handsome, collectible copy! New York: G.P. Putnam's Sons, . FIRST EDITION. Near fine copy in a bright unfaded dust jacket with a few tinty nicks at extremities. Nice copy of the author's first book. Filmed in 1955 starring Van Heflin and Tab Hunter. PUTNAM. NY 1953. Very Good. 1953. First Edition. Hardcover. 0399100725 . A solidly very good+ copy in a Vg.+ dj. (Two inch tear at base of front cover of dj., extending to spine. A few internal tape repairs to dj. Traces of faint shelfsoiling at top edge. Dj. flaps are clipped at corners, but not the printed price) Author's FIRST book. Directed by Raoul Walsh in 1955. .
New York: G. P. Putnam's Sons, 1953. Famed author's first novel, a classic WWII story of "Huxley's Whores" one of the toughest outfits in the Marine Corps. It covers the men of one radio squad and their adventures from boot camp to Guadacanal, Tarawa, and elsewhere. The book is tightly bound but shows slightest wear around the spine ends and corners. Clean covers and clean pages without names or other markings. The DJ is not price clipped but with edgewear at the head and foot of the spine and corners which show light chipping. The bottom edge of the DJ shows some missing chipps with the worst at the bottom front right edge which has a chip about one-quarter inch high and three-quarters inch wide missing. The white portions of the DJ typically show some age tanning or browning but this copy is still mostly white. Becoming hard to find in the first edition. Now protected by a removable mylar cover.. First Edition. Boards HB. Near Fine/Good Plus. New York: G.P Putnam's Sons, 1953. Tan cloth with red Marine Corp symbol on upper board. Unpriceclipped dust jacket chipped on edges and with some soiling, but overall good. Classic fiction of WWII Marine fighting in the Pacific.. First Edition. Cloth. Very Good/Good. 8vo - over 7¾" - 9¾" tall. Trade. G. P. Putnam's Sons, 1953-06-01. 1st. Hardcover. Used:Good. G. P. Putnam's Sons. Collectible - Good. NY: G P Putnam's Sons 1953. 1st with no additional printings mentioned. Hardcover 8vo 505 pgs. Good in a good dust jacket. Covers edgeworn and bottom corners bumped. Owner name in ink to front endpaper and dated 4/53. Light foxing to endpapers. Contents clean and binding sound. Jacket edgeworn, torn and chipped. Jacket rear toned and spine sunned. Inquire if you need further information. New York: G. P. Putnam's Sons, 1953. Book. Very Good. Hardcover. 1st Edition. Dark blue paper covered boards, lettered in orange. Minimally ex-library copy with light tape ghosting along each edge where the old DJ mylar had been anchored, a few remnants of date due slip remaining on rear flyleaf, but no marks or stamps. Former owner's signature inked out on front flyleaf (date remains), and both flyleaves also show light tape ghosting. Mild rubbing to corners and spine extremities, bottom edges. Firm binding, otherwise clean interior. [vi],505 pp. Color illus. dust jacket shows some wrinkling along top edge and light wrinkling to both panels, with light dampstaining evident on lower front flap and along front flap fold, evident only as mild lightening along lower portions of front and spine panels, white background on rear panel quote from McCaul lightly tanned toward edges, in new mylar. Author's first book. First edition, 1st ptg. with no additional printings indicated. Dust jacket also first state, with no statement of a later printing on the front flap. Clearly shows use but has no compromising condition issues..
Munchen, Germany: Verlegt Bei Kindler, 1961. Believed to be first edition of German language edition of Battle Cry, Uris's first novel of the Marine Corps in World War II and basis for the fine movie starring Van Heflin, Tab Hunter, and Aldo Ray. Leon Uris, Autor von "Exodus", zeigt hier am dramatischen Schicksal einer Handvoll junger Freiwillliger des US-Marine korps den erbarmungslosen Schliff und Drill, dem die Rekruten unterworker sind, ebenso wie die verzweifelt Auseinandersetzung mit dem Tod, die Problematik der ersten Liche and die gahnende Langeeile in der Etappe.Book has a small sticker on front pastedown "Libreria Goethe" but no other indications that it is ex-library, also a tiny hole near bottom of front cover and spine. Otherwise clean and not shelfworn. DJ is plain unlaminated paper (thus subject to wear) but shows only slight edgewear. Tiny chips are showing on the corners and spine ends. Now in mylar cover.. First Thus. Cloth HB. Very Good/Good Plus. Bantam Books, 1982-03-01. Mass Market Paperback. Used:Good. Avon, 2005-06-28. Mass Market Paperback. Used:Good. 1980-01-03. Good. Ships with Tracking Number! INTERNATIONAL WORLDWIDE Shipping available. May not contain Access Codes or Supplements. May be ex-library. Shipping & Handling by region. Buy with confidence, excellent customer service! New York,, NY, U.S.A.: G. P. Putnam's Sons, 1954. Book. Very Good. Hardcover. First Edition. 1953 G P Putnam's TREU FIRST Edition, FIRST printng as evidenced by no other printings noted as well as an owner signature with a date of 2/14/54. A VG- copy lacking a DJ. The boards have minor wear atthe edges, corners and spine ends. The page ends have some toning. However the interior is clean and tight! **BONUS** Also receive the 1984 Doubleday First Edition of The Haj in VG-/VG- condition..
1982-04-01. Good. Ships with Tracking Number! INTERNATIONAL WORLDWIDE Shipping available. May not contain Access Codes or Supplements. May be ex-library. Shipping & Handling by region. Buy with confidence, excellent customer service! 2019-02-26. Good. Ships with Tracking Number! INTERNATIONAL WORLDWIDE Shipping available. May not contain Access Codes or Supplements. May be ex-library. Shipping & Handling by region. Buy with confidence, excellent customer service! Penguin Publishing Group, 1953. Hardcover. Very Good. Disclaimer:A copy that has been read, but remains in excellent condition. Pages are intact and are not marred by notes or highlighting, but may contain a neat previous owner name. The spine remains undamaged. At ThriftBooks, our motto is: Read More, Spend Less.Dust jacket in good condition. Seventh printing. Minor shelf and handling wear, overall a clean solid copy with minimal signs of use. Price clipped. Sound binding with square points. Pencil price in upper right of first free page. All other interior contents free from extraneous markings. Shelved and shipped in new mylar wrapper. Secure packaging for safe delivery.Dust jacket quality is not guaranteed. 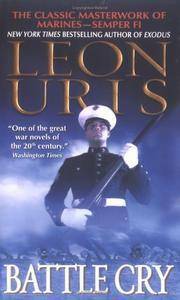 Uris, Leon [Leon Marcus Uris (August 3, 1924 - June 21, 2003) was an American author, known for his historical fiction. His two bestselling books were Exodus published in 1958 and Trinity published in 1976]. Published by G. P. Putnam's Sons, New York, Fourth Printing 1953. 1953., 1953. Fourth printing hard back binding in publisher's original black cloth covers, scarlet title and author lettering to the spine, scarlet motif to the front cover, fore page edges untrimmed. 8vo. 9'' x 6¼''. Author's first book. Contains 505 printed pages of text. Very Good condition book in Very Good condition dust wrapper with light rubbing to the corners and edges, not price clipped, $3.95. Dust wrapper supplied in archive acetate film protection. Member of the P.B.F.A. New York: G. P. Putnam's Sons, 1953. Black boards rubbed at corners and tips, light rubbing on hinges. Pages are clean, text has no markings, binding is sound. . Third Impression. Hard Cover. Good/No Jacket. 8vo - 7¾" - 9¾" Tall. Bantam. PAPERBACK. 0553144820 New Condition. . New. G. P. Putnam's Sons, 1953-06. Hardcover. Good. London : Allan Wingate, 1953. First UK Edition. Fine cloth copy in an equally fine dust wrapper. Particularly and surprisingly well-preserved; tight, bright, clean and especially sharp-cornered.. Physical description; 505 p. ; 22 cm. Subjects; Marines. World War II (1939-1945). United States. Genre; Fiction. Bantam Books. MASS MARKET PAPERBACK. 0553209914 New Condition. . New. Allan Wingate London 1956. First UK edition. Previous owner's inscription, foxing, pages browned o/w just good. Jacket - spine a little faded, edgeworn & torn. G. P. Putnam's Sons. Used - Acceptable. Ships from the UK. Former Library book. Shows definite wear, and perhaps considerable marking on inside. 100% Money Back Guarantee. Your purchase also supports literacy charities. Bantam Books. MASS MARKET PAPERBACK. 0553209914 Like New Condition. . Fine. Bantam. PAPERBACK. 0553144820 Like New Condition. . Fine. Bantam Books. Used - Acceptable. Acceptable condition. Dampstained. Penguin Publishing Group, 1953. Hardcover. Acceptable. Disclaimer:A readable copy. All pages are intact, and the cover is intact. Pages can include considerable notes-in pen or highlighter-but the notes cannot obscure the text. An ex-library book and may have standard library stamps and/or stickers. At ThriftBooks, our motto is: Read More, Spend Less.Dust jacket quality is not guaranteed. Penguin Publishing Group, 1953. Hardcover. Acceptable. Disclaimer:A readable copy. All pages are intact, and the cover is intact. Pages can include considerable notes-in pen or highlighter-but the notes cannot obscure the text. At ThriftBooks, our motto is: Read More, Spend Less.Dust jacket quality is not guaranteed. London: Granada, 1985 Unmarked. Dust jacket is intact and bright, very slight fading to the spine. Bantam. Used - Acceptable. Shows definite wear, and perhaps considerable marking on inside. G. P. Putnam's Sons. Hardcover. 0399100725 Has loose spine/binding. Pages still intact. Tear on cover. Acceptable Condition. Five star seller - Buy with confidence! . Fair. London : Allan Wingate, 1955. Second Cheap Edition. Very good cloth copy in a near-fine, very slightly edge-nicked and dust-dulled dust-wrapper, now mylar-sleeved. Remains particularly and surprisingly well-preserved overall; tight, bright, clean and strong.. Physical description; 432p. ; 22 cm. Subjects; Marines. World War II (1939-1945). United States. Genre; Fiction. Bantam. Used - Very Good. Very Good condition. With remainder mark. Granada, 1985. Hardcover. Good. Disclaimer:A copy that has been read, but remains in clean condition. All pages are intact, and the cover is intact. The spine may show signs of wear. Pages can include limited notes and highlighting, and the copy can include previous owner inscriptions. At ThriftBooks, our motto is: Read More, Spend Less.Dust jacket quality is not guaranteed. New York: Bantam Books, 1953. Paperback, cover has some minor creases, small tear at spine, peel where original price sticker probably was, last printing stated is the 24th in October 1962, the big novel of the U.S. Marines. Paperback. Good/No Jacket. Random House Publishing Group, 1982. Paperback. Acceptable. Disclaimer:A readable copy. All pages are intact, and the cover is intact. Pages can include considerable notes-in pen or highlighter-but the notes cannot obscure the text. At ThriftBooks, our motto is: Read More, Spend Less.Dust jacket quality is not guaranteed.